The Marangu route is the oldest route on Kilimanjaro. It is special because it is the route that most closely resembles that of Hans Meyer, the first person to have summited Mount Kilimanjaro. It is the only route that has basic hut shelters along the way, equipped with beds, removing the need for camping. 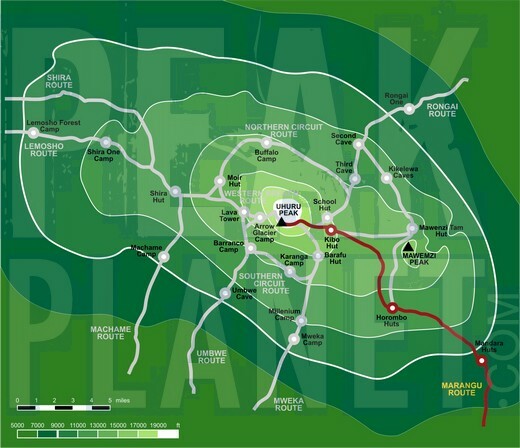 The Marangu route begins from the gate located southeast of the peak, and gradually climbs each day. The summit approach is from Kibo Hut. The descent is down Marangu. This is the only route that uses the same descent route, thus limiting the scenery you experience. The Marangu route measures a distance of 40 miles (64 km) and takes 5-6 days. Arrive anytime in Marangu, Tanzania. We take a ride to Marangu Gate to complete the necessary registration formalities, then begin the walk to the Mandara encampment. We trek through a lush, thick rainforest, where there is a high chance of rain in the afternoon, and arrive at Mandara Hut (8,900 ft). We take a steady ascent through the temperate forest zone for a short time, before reaching the heather and moorland zone. Here we enjoy views of the mountain peaks at this altitude. We continue to a valley surrounded by giant lobelia and groundsel, flora which are characteristic of this semi-alpine zone, and overnight at Horombo Hut (12,200 ft). We cross the lunar desert of the saddle between Mawenzi and Kibo to reach Kibo Hut(15,400 ft) at the bottom of the crater wall. The remainder of the day is spent resting in preparation for an early morning final ascent.	.
We start the final and most demanding part of the climb by torchlight around 1 a.m. We plod very slowly in the darkness on a switchback trail through loose volcanic scree to reach the crater rim at Gillman’s Point (18,600 ft). We rest here for a short time to enjoy the spectacular sunrise over Mawenzi. Those who are still feeling strong can make the three-hour round trip to Uhuru Peak (19,345 ft), passing close to the spectacular glaciers and ice cliffs that still occupy most of the summit area. The descent to Kibo Hut (15,400 ft) is surprisingly fast and, after some refreshments, we continue the descent to Horombo Huts (12,200 ft). A steady descent takes us down through moorland to Mandara Huts (8,900 ft). We then continue descending through lovely lush forest on a good path to the Kilimanjaro National Park gate at Marangu (6,000 ft), where we are transferred back to Marangu. After breakfast, we can arrange for a private transfer or taxi to Kilimanjaro International Airport (JRO). Copyright (c) 2014 KilimanjaroClimbingRoutes.com. All rights reserved.